Pasta is a staple food of traditional Italian cuisine, with the first reference dating back to 1154. The popularity of pasta spread to the whole of Italy after the establishment of pasta factories in the 19th century, enabling the mass production of pasta for the Italian market. Today pasta has entered every nook and corner and is one of the most popular dishes all over the world. 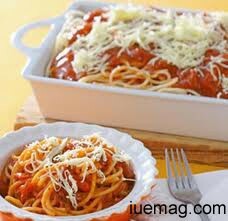 Here is a very simple Italian spaghetti pasta recipe to woo your loved ones. This recipe serves 2 people. Add water in a large pan and bring to boil. Add salt. In a sauce pan, heat oil. Add garlic & onion and sauté till it turns light golden brown. Add the tomato puree and tomato pieces and bring to boil. Add little water if necessary. Add black pepper, salt and Italian pasta seasoning. Adjust to taste. Drop the cooked pasta into the sauce and toss lightly. Mix well and garnish with parmesan or normal cheese. Optional: You can add sliced bell peppers or olives as vegetables for extra taste.